Angels & Airwaves is an American rock supergroup, featuring Tom DeLonge (lead vocals, guitars, keyboards), David Kennedy (guitars and keyboards), Matt Wachter (bass guitar, keyboards, backing vocals), and Ilan Rubin (drummer, keyboards, backing vocals). Former members includes Ryan Sinn (bassist and backing vocalist), Adam “Atom” Willard (drummer) and Eddie Breckenridge (bassist). The band formed after Blink-182 went on hiatus in 2005. They continued to record and tour despite DeLonge reigniting his career with Blink-182 in 2009, and after DeLonge subsequently parted with Blink-182 in 2015, he began to focus on Angels & Airwaves more extensively. The band has released five studio albums We Don’t Need to Whisper (2006), I-Empire (2007), Love (2010), Love: Part Two (2011) and The Dream Walker (2014). The project also resulted in the documentary film Start the Machine (2008). In 2011, accompanying the two Love albums, the group scored and produced the science fiction drama film Love by director William Eubank in 460 theatres nationwide during their multimedia event, Love Live. The band released an animated short named Poet Anderson: The Dream Walker and their fifth album, The Dream Walker, on December 9, 2014. Other related media, such as comic books and a live-action film, followed in 2015. 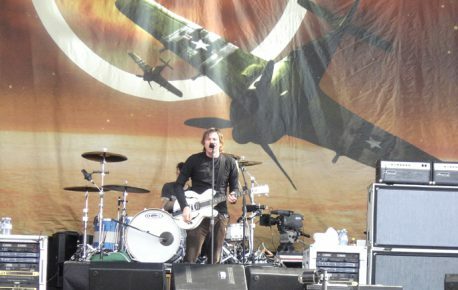 The group has been described by DeLonge as more than a band, but more accurately “an art project [that approaches] larger human themes and tackles them in different mediums”, or simply “a multimedia project”. This has been seen in the group’s films, live events, and novel approach to fan-artist interaction. Of the first two albums, the band says that they were mainly influenced by the music of Radiohead and Pink Floyd, combining them with the grandiosity of U2. Of the first album, Delonge said that it would be “the best music in generations”, but afterwards admitted that during this time he was addicted to painkillers due to suffering a slipped disc in his back some years prior.